Research background: Despite the economic development, accompanied by various structural reforms (including pension reform of 1999), the effective retirement age in Poland is relatively low. Participants of the social insurance scheme tend to apply for the old-age pension as soon as possible (when they reach the statutory retirement age). 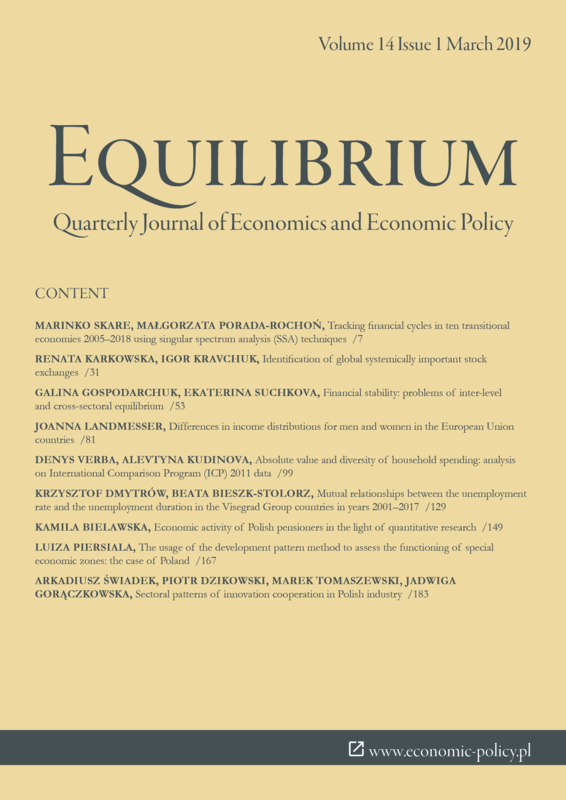 Purpose of the article: The main aim of the paper is to evaluate the determinants of the economic activity of seniors in Poland taking the old-age pension form Social Insurance Institution (ZUS) as a regular or occasional work, in comparison to those who are not performing any paid activity. Methods: We use the data from the survey carried out in 2018 on the representative sample of Polish seniors aged 65+ for whose households the old-age pension from ZUS (1336 pensioners who retired between 1980’s up to 2018) is the main source of income. Multinominal logistic regression was performed to study how gender, retirement timing, education level and period of retirement as well as reasons for retirement influenced the likelihood to continue regular or occasional work. Findings & Value added: Multinominal logistic regression for women confirms that higher education increases chances for continuing regular work on the retirement comparing to those having secondary education. Retirement due to the reaching the pensionable age made women more likely to continue work on regular basis, while those who retired due to the bankruptcy of the employer were less likely to be employed during retirement. Retirement due to the preservation of pension privileges increased chances to continue work on the occasional basis among women and men. For men who reported employment - related factors as retirement drivers, the chances of performing occasional work were high and of highly statistical significant. This research delivers knowledge on drivers of regular or occasional paid activity combined with receiving old-age pension from social insurance system in Poland. Alcover, C., Topa, G., Parry, E., Fraccaroli, F., & Depolo, M. (Eds.) (2014). Bridge employment: a research handbook. New York: Routledge. Beehr, T. A., & Bennett, M. M. (2015). Working after retirement: Features of bridge employment and research directions. Work, Aging and Retirement , 1. doi: 10.1093/workar/wau007. countries. Financial Science, 2(31). doi: 10.15611/nof.2017.2.01. Cahill, K. E., Giandrea, M. D., & Quinn, J. F. (2006). Retirement patterns from career employment. Gerontologist, 46. doi: 10.1093/geront/46.4.514. ers. Journal of Labor Economics, 19(2). Chłoń-Domińczak, A. (2017). Poles above Age 50: work and retirement. In: M. Myck & M. Oczkowska (Eds.). Generation 50+ in Poland in the view of Europe: activity, health and quality of life. Outcomes of the SHARE. Warsaw: Center for Economic Analysis. Coile, C. C. (2015). Economic determinants of workers’ retirement decisions. Journal of Economic Surveys, 29. doi:10.1111/joes.12115. Disney, R, Ratcliffe, A., & Smith, S. (2015). Booms, busts and retirement timing. Economica, 82. doi:10.1111/ecca/12133. Duval, R. (2003). The retirement effects of old-age pension and early retirement schemes in OECD countries. Paris: OECD. European Commission (2012). White paper “An agenda for adequate, safe and sustainable pensions”. COM(2012) 55 final: Brussels. and divergence. New York: Palgrave Macmillan. Kantarci, T., & van Soest, A. (2008). Gradual retirement: preferences and limitations. De Economist, 156. doi:10.1007/s10645-008-9086-1. Kim, S., & Feldman, D. C. (2000). Working in retirement: the antecedents of bridge employment and its consequences for quality of life in retirement. Academy of Management Journal, 43. doi:10.5465/1556345. Maestas, N. (2010). Back to work: expectations and realizations of work after retirement. Journal of Human Resources, 45. doi:10.1353/jhr.2010.0011. OECD (1995). The transition from work to retirement. Social Policy Studies. No. OECD (2018). Average effective age of retirement (indicator). Retrieved from http://www.oecd.org/els/emp/average-effective-age-of-retirement.htm (18.11.2018). Oleksiyenko, O., & Życzyńska-Ciołek, D. (2018). Structural determinants of workforce participation after retirement in Poland. Population Ageing, 11. doi: 10.1007/s12062-017-9213-3. Quinn, J. F., Burkhauser, R. B., & Myers, D. A. (1990). Passing the torch: the influence of economic incentives on work and retirement Kalamazoo, MI: W.E. Upjohn Institute for Employment Research. Ruzik‑Sierdzińska, A. (2018). An attempt to identify factors influencing retirement decisions in Poland. Folia Oeconomica. Acta Universitatis Lodziensis, 4(336). doi:10.18778/0208-6018.336.03.